You want to book a magical experience for your child's Birthday? Awesome! What makes your show special? I specialize in making sure children have the very best time! 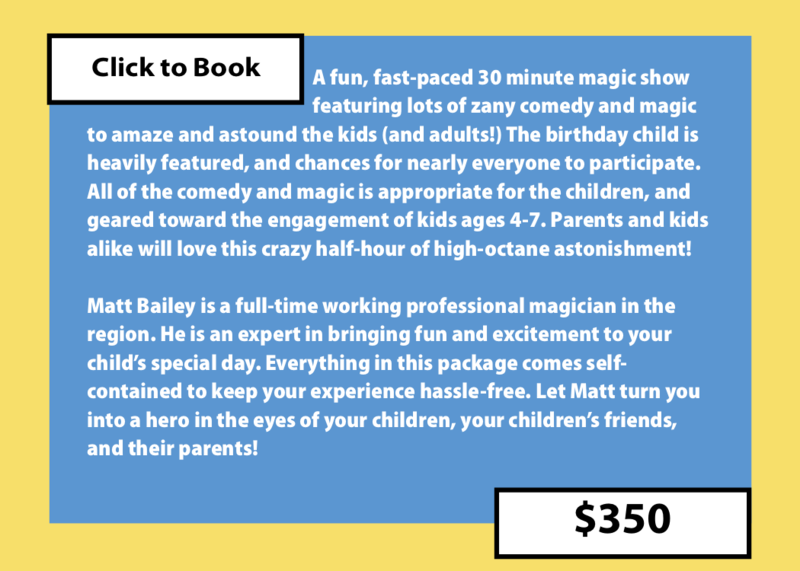 There are a lot of performers to choose from in region, but not that many full-time professionals who specialize in children’s magic and creating a memorable birthday experience for kids. 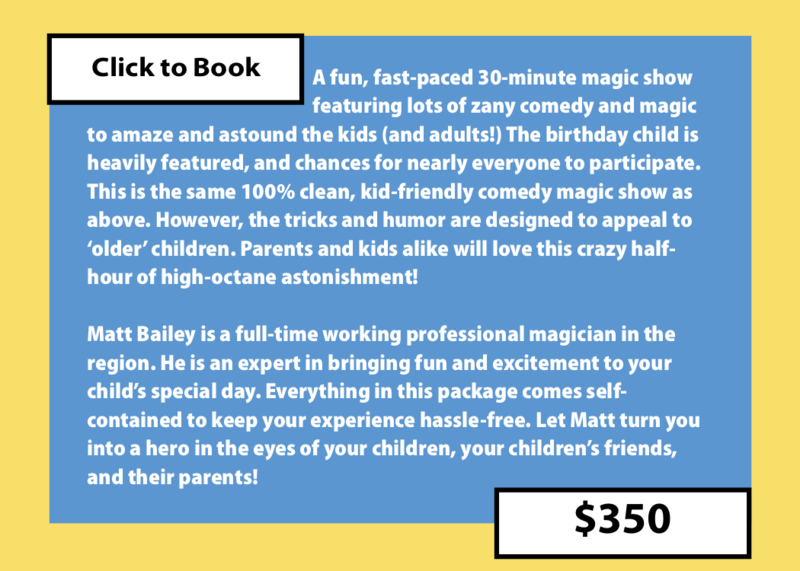 A magician that does stage shows, advertises ‘comedy magic!’ or is otherwise a ‘general practitioner’ of this art is often ill-equipped to meet your needs as you plan a special event for your little one. The kind of important skills needed to keep kids entertained can only be learned through years of performing for this very special group! For what age range is your birthday show most appropriate? While ‘kids of all ages’ can have fun during my show, children aged 4-12 tend to have the most fun with a magician at their birthday party. See the packages offered to find the show for your desired age group. ‘MagiQuist’ is a hybrid of the words ‘Magician’ and ‘Ventriloquist.’ I came up with this word to describe the fact that my show offers both comedy magic and ventriloquism. However, shows are available without ‘vent’ for any youngsters who might feel uncomfortable around puppets. Absolutely nothing except the space and an audience! My show is 100% self-contained. No electricity will be needed, unless we discuss arrangements for sound equipment. Should adults be present for your show? Yes, please! I prefer at least two adults to be present in the room to assure everyone’s enjoyment. However, all party-goers are welcome to watch! While my birthday show is geared towards making sure the kids have a great time, it is often the adults who have the most fun by watching the joy on the kids’ faces! How Much Space Do You Need? Inside or Outside? Inside is usually the perfect place to set up! The environment is better controlled, and the children can stay focused on all our fun with minimal distraction. This makes the show better for everyone. I usually ask for a 6’ x 6’ area for my equipment. The kids can sit on the floor, in chairs, or at tables in front of this space. Nothing in my show will ever damage your personal property or your home. While I can also perform outdoors, this is entirely weather permitting. If there is any question about the weather on the day of your show, it may be a good idea to find a back-up location indoors. Myself and my assistant will arrive at your birthday event about 20 minutes before the show starts. This is so we can set up. It takes 10-15 minutes to pack up. How is payment accepted? Is there a required deposit? No deposit is required! Payment is made upon arrival. Payment is accepted via cash or check. Tipping is at your discretion if you feel you have received service above and beyond your expectations. I guarantee the same level of quality, professionalism, and care regardless. May we take photos or video your show? Absolutely! Please take as many as you would like! Not only do I approve of and encourage photo-taking and video shooting, I ask that you send them me or tag our page in anything you post. It’s always great to capture priceless memories. Performances may be canceled up to 14 days before the performance date without penalty. If the show is cancelled with less than two weeks' notice, you will be responsible for payment of the fee in full. However, this may be applied to a future party. Please note that any risk of bad weather for outdoor events is borne entirely by the client, and that cancellations due to bad weather are subject to the full fee. And may I suggest again, if there is any question about the weather on the day of your show, it is a great idea to have a back-up location indoors. How long should my party be? When should the show happen? Generally, birthday parties are anywhere from 2-3 hours. This gives enough time for all the fun happenings: from the magic show, to singing Happy Birthday, to of course opening presents! You may want to allow some ‘lag time’ for late arrivals. So, if you schedule your party to begin at 2:00pm, I recommend scheduling the magic show for 2:30. This way, nobody misses the start of the silliness!